An unknown quantity. With some cars you know what you’re going to get. With the limited-run Lamborghini Aventador LP750-4 Superveloce, I’m not so sure. The past couple of new Lamborghinis we’ve driven have left our flabbers slightly unghasted. The Aventador is stupidly fast but can feel clumsy, while the smaller, cheaper Huracán is also absurdly quick at the money, but in making it easy to drive, Lamborghini has also left it a touch one-dimensional. In some ways, both feel a bit ‘not for us’. But, says Lamborghini, this is a Superveloce. And this is different. There have only been three SVs in Lamborghini’s history before now, and in Miura, Diablo and Murciélago forms they’ve respectively developed 385, 530 and 670 metric horsepower. Plenty at the time, but nothing to the 750 indicated by the name of the Aventador. Seven-fifty foreign nags is 740bhp, here developed by a 6.5-litre naturally aspirated V12 engine that revs to 8500rpm. Not for Lamborghini forced induction – just a whopping, easier-breathing engine in the middle of the car, with a new exhaust and a raised rev limit over the standard V12. It also makes 509lb ft at 5500rpm. In ‘regular’ Aventador form, it’s one of the world’s great powerplants. Here it should be even better. 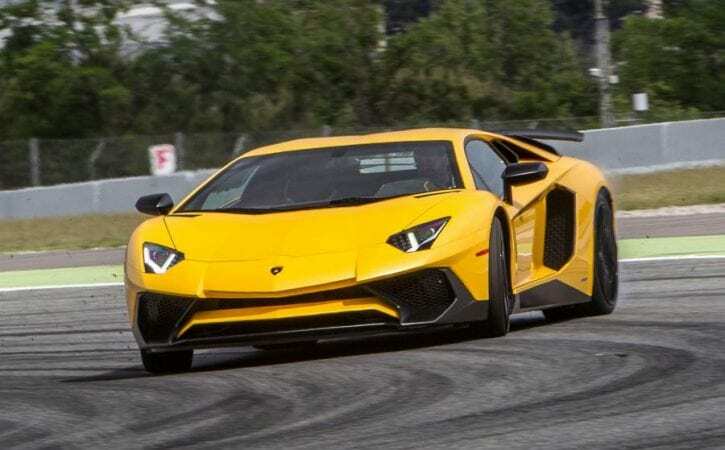 Again it’s mated to a single-clutch automated manual gearbox with, we’re promised, an improved shift calibration, but more significant still is the fact that the SV is an impressive 50kg lighter than the regular Aventador. There are new door skins and a couple of lighter carbonfibre panels, clad over the carbonfibre monocoque, but you suspect the real weight saving comes in the stripped-out interior. Lamborghini quotes a dry weight of 1525kg, which you could probably make closer to 1700kg by the time it sits at the kerb. What else? A big rear wing that gives serious downforce. Magnetorheological adaptive dampers are standard on the SV, as is dyamic steering – which changes ratio depending on road speed and a host of other factors like how much of a ‘bung’ you give the car on the way into a corner. We don’t like the system much on the Huracán, but Lamborghini engineers tell us it is improved here. Oh, and the price is up from around £260,000 to a whisker over £320,000. There will only be 600 of them. Good. Really good. And by gum it’s fast. The 0-62mph time is claimed at 2.8sec, and I believe it. That’s only down by 0.1sec from the standard car, but that’s because when you’re talking 691bhp versus 740bhp, low-end acceleration is limited mostly by traction anyway. The top speed – more than 217mph – is actually electronically governed. When will the horsepower war end? Not yet, according to Lamborghini’s head of research and development, Maurizio Reggiani. The extra power is largely irrelevant, he says, at lower speeds. It’s when you’re well over 125mph that the extra shove makes a difference, keeps the acceleration from tailing off, and why it’s worth having. Apparently. Well, if an engine that makes that amount of power is as good as this, then I’m cool with that. The response of the big V12 is sensational, especially if you push the buttons that takes the car’s set-up from Strada, past Sport and into Corsa. Not only does that improve the throttle response to electric levels, but it also changes the calibration of the dampers, the steering and the four-wheel drive system, which is actually slightly more rear-biased in Sport than Corsa. In Corsa, forget having fun; it’s all about going fast. And this car is fast everywhere. I say ‘everywhere’: we’ve only driven it on a track in Barcelona, and then for not very long. But even on this acquaintance, I can tell you that it feels genuinely agile and alert, in a way the standard car simply isn’t. Partly that’s because of the reduced weight, partly the downforce and partly the adaptive dampers keeping a tight control of the body movements. But it’s also because the steering is quick – more on that in a moment – and the chassis is extremely throttle adjustable. On a steady throttle and smooth movements, the SV will understeer a touch. Lifting brings it back into line smartly, but it’s very happy to be deliberately upset if you shift its body movements around and/or suddenly give it lots of power, at which point it’ll oversteer quite happily. And quickly. Eventually the 4WD system shuffles power around and it’ll pull itself straight, but such is the pace, power and weight that it would be quite possible to have a massive moment in this car. It does, at least, have hugely powerful carbon-ceramic brakes, but it’s a car that quite likes positive, smooth, controlled pedal applications. Use those and it’s hugely rewarding. And bonkers fast. To the steering, then, because it hasn’t been without controversy in the past. Here, it’s better. Even around most hairpins, you don’t need more than a third of a turn of lock, because the ratio quickens, which is most of the point of dynamic steering. It’s also stable at high speeds because the ratio slows, which is the rest of the point. And it’s just about natural enough in its operation. Still, for my money, it’s not as satisfying as the conventional rack in a McLaren 650S, but to make a big car feel agile, it does its job; it’s less nervous than a Ferrari F12’s set-up, for example. Any other downsides? The gearbox is also improved and gives a satisfyingly quick shift at maximum revs at full throttle, but still a single-clutch automated manual can feel lethargic at lower revs and smaller throttle openings. It doesn’t spoil things, though. The SV is a hugely likeable car – a wild Lamborghini of the old school.